Dane Goodman is a fascinating enigma. 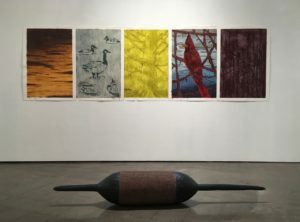 That suspicion is roundly confirmed by the veteran artist’s current mini-retrospective show, “Consorts,” now at UCSB’s College of Creative Studies Gallery. 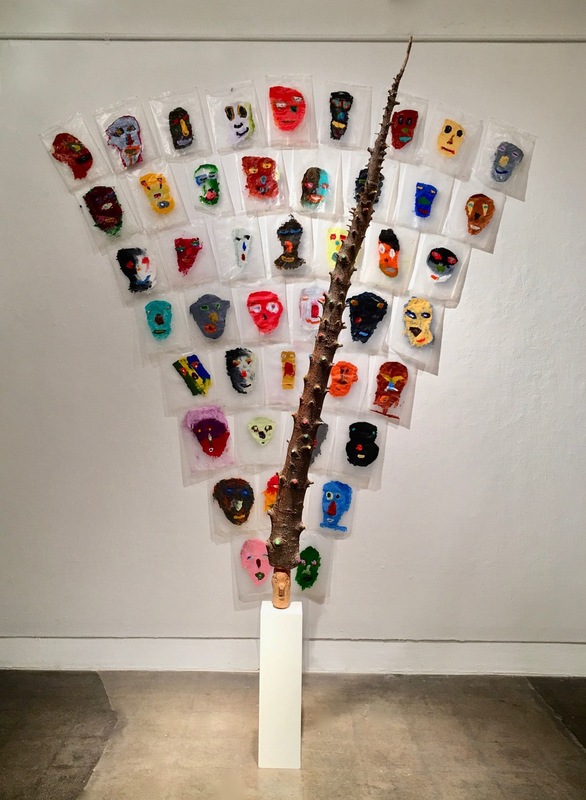 If Mr. Goodman—long one of the more important Santa Barbara-based artists, as well as a sturdy figure behind the art scene scenes-is a slippery, ever-changing creative channeler, his work is given greater context, contrast, and, yes, consorting power here. 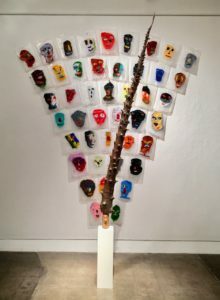 Although we’ve seen select works and varied series of his art in many settings in town over the years, the CCS show gives us a bigger picture of how the divergent pieces fit into the Goodman puzzle. Still, expect no major “aha moments” or points of connectivity to emerge via the show, spanning a range of art from 1978 to 2018. Rather, what settles over the span of his art so far is a cohesive sensibility and imprint-partly based on the theory of stylistic and material-based malleability. Things change, but are tethered to an anchoring life force and “voice” in his art. Certain core elements hum beneath his art, including aspects of conceptualism, surrealism, post-Pop Art whimsy, dark humor, a signature flair for gentle absurdity, and the shifting winds of modern art historicism. His art can be elegant and tidy, from certain angles, while also embracing a certain mad glee and child-like prankster quality, marked by an elegance on the verge of becoming unhinged. 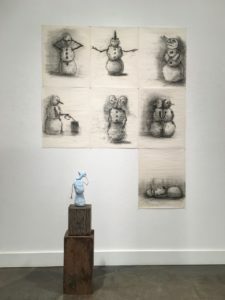 Recent examples of the artist’s public showings include the innovative two-person, totally collaborative show with the late Keith Puccinelli, “Tug,” at the Westmont Museum of Art in 2015. Much more recently, Mr. Goodman’s 1975 “Sunday Papers” was a titillating and tittering, whimsical minimalist send-up, part of the Santa Barbara Museum of Art’s “Summer Nocturne.” Here, a series of deceptively tidy painted squares is offset by the clowning presence of a jumbo painted pencil, leaning against the wall like a friendly intruder on the two-dimensional entity. Following that track of interrelating two- and three-dimensional works, “Consorts” (think of the word as both noun and verb) bustles with such peculiar blends of physicality and representation of many stripes. 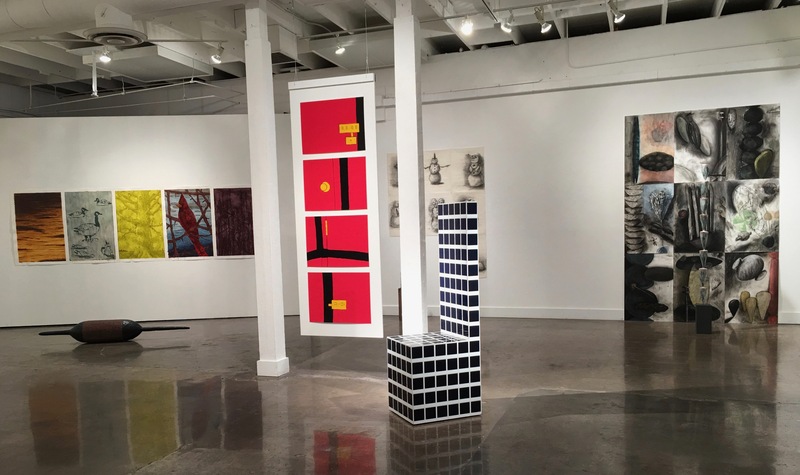 As expected from Mr. Goodman, who has worked as an exhibition designer for SBMA and an admired gallery director for City College’s Atkinson Gallery, the very installation aesthetic at CCS makes for a commanding presence in the space. 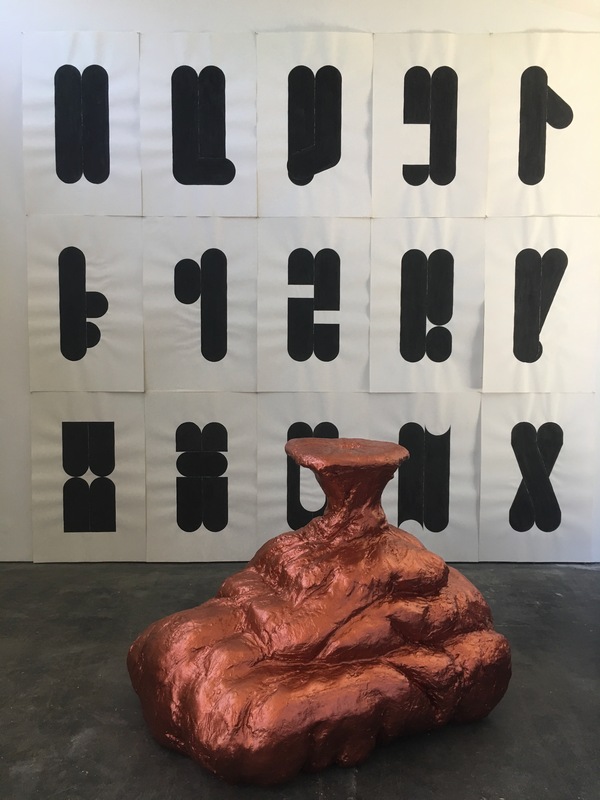 At once graceful and slightly loony, the careful arrangement of sculptural objects set before two-dimensional pieces-usually in a group or series-and in sometimes bizarre dialogues. Certainly, a discernible logic prevails in the delightfully loopy snowman portrait series, with seven charcoal drawings and, on the floor, a small sculptural character, “repose” (Mr. Goodman’s deadpan character is reflected in his use of almost all lower-case titles). Humor and poignancy dance together in this series, portraying an archetypically innocent and child-like, and yet definitively short-lived and seasonally doomed subject. Across the room, “tree head,” a large Christmas tree branch festooned with bright-hued dots passing for holiday lights stands before the cartoony faces of “rank and file,” crude cartoony faces on plastic cereal bags. They add up to a giddy but also scary posse, akin to the dichotomy of spooky clowns. Mortality returns, more directly, with the primitive silhouetted drawings of “Lyle and grace” and “gone.” A relative’s terminal illness and passing is the underlying topic of these images from acrylic and soap, with a visual effect of dried blood washes, a metaphor of life’s ephemeral nature. Seizing attention, and a properly perplexed response, from those entering the gallery, we find the lumpen yet copper-shiny sculpture “parcel of privacies,” suggesting a distended hot water bottle filled with some undetermined but apparently “private” substance. Chalk up its appeal to some sort of metaphysical scatology. Hanging on the wall behind the 2017-vintage “parcel” is his minimal 1986 set of drawings under the title “sunrise/sunset,” a set of large, cryptic shapes embodied and encoded as limbs/letters. From 1996, his “Makinaw Quintet” veers in yet another direction from other art in the room, a closet naturalist’s tribute to birds and their habitat, complicated by semi-abstract settings. Or else the series is an artistic exercise and outing, with bird life as an imagistic decoy. Your choice, as beholder. In another corner (well, in the gallery’s mid-section, actually), form fools function. His 1980 “Red Room drawings” consists of simple, bright red-suffused depictions of utilitarian objects (an AC outlet, door knobs, hinges) next to a forbiddingly angular chair, called “Urban” (1982), with deep blue Polaroid prints posing as stylish tiles on the chair. Another older work in this selection is 1979’s “MX/NY,” a suite of nine fuzzy flag-like paintings, in a cross-cultural puzzler. “Wichita sketchbook,” from 1993, continues with the sculptural- paradox in Goodman’s art, a balance of numerous small charcoal quick sketches above a narrow shelf of tiny sculptures made from model magic. Faux archeology and questions concerning artifice and the perceived reality of representational art arise—but gently and playfully, as is the artist’s wont. In this selective collection of work, the latest creations from Goodman’s world and nimble artistic mind is almost coyly tucked in a half-hidden niche in the gallery’s center, and semi-obscured by another newish piece. The newly created “double sweep,” a chalkboard smorgasbord of visual stimuli and scribblings, also serves as a base for his 2016 work “re-finery.” The medium here is indented aluminum, with the identifiable shape of a broom imposed like a palimpsest, and reminiscent of Jaspar Johns’ studio-tool “found object” pieces (as seen at the big Johns blockbuster at the Broad Museum in Los Angeles). In this setting, though, the more pressing point of comparison and echo of past art was just lurking in an SBMA gallery downtown, in the form of the giant, sidling pencil on Mr. Goodman’s “Sunday Papers.” One work, and one era, cross-talks and consorts with another, without ever explicitly exposing the magician’s trick book. Touche.